Mahindra First Choice Services (MFCS) is a company of Mahindra Group and is India’s leading chain of multi-brand car workshops with over 335+ workshops present in 267+ towns & 24 states. It has serviced over 10,50,000 cars. The company aims to establish country wide network of over 400 workshops by March 2018. Marching towards its vision - to be amongst the top 3 service providers for out of warranty cars by 2018. MFCS is aggressively making inroads in Indian car service market, which has historically been shared by OEM dealers and Independent Garages. MFCS is a one-stop-shop for service and maintenance needs of any brand of car. It promises to provide quality, professional and trustworthy services to end woes of car owners in the country. MFCS has also entered into business of private label spare parts for all brands of cars with a brand name ‘MFC’. MFC brand stands for smart replacement, for the customers who want value for money products for their car.MFCS has also taken a digital initiative, Carworkz, the first unique aggregator in car servicing industry. 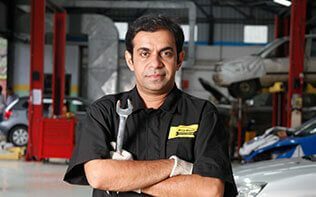 For car owners, a mobile and web based platform where car owners can find best workshops for servicing their car, they can also get service estimates through its service estimator tool, customers get exclusive offers and can book appointments online.